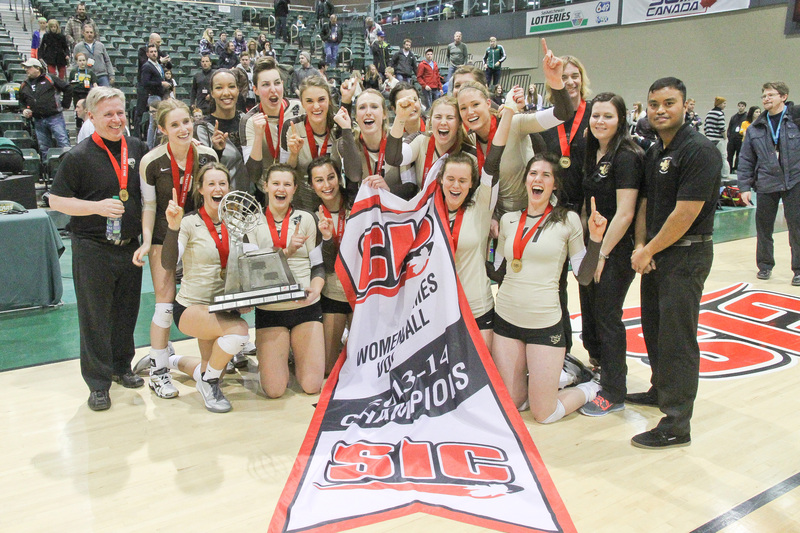 This past weekend, Bisons volleyball hosted the Thompson Rivers University Wolfpack as both the men’s and women’s teams resumed conference play after the long December layoff. In their first conference game in nearly a month and a half, the women’s volleyball team made it look easy, defeating the Wolfpack on Friday by a score of 3-0 (25-13, 25-15, 25-18). The Bisons squad, who had gone 7-2 before the break, didn’t seem to miss a beat in their return, knocking off 11th-ranked Thompson Rivers. The winless TRU team was able to keep the score close in the opening frame but as the game wore on the Wolfpack defence only got weaker as the Bisons’ attack heated up. With both teams tied at 11 in the first set the brown and gold began to pull away, scoring numerous kills for a 25-13 advantage. The women’s team didn’t lose any momentum in the second either as they racked up another 12 kills and six aces to take the set by a score of 25-15. The last set of the game proved to be much more competitive but in the end the Wolfpack could not overcome the relentless attack of the Bison women, falling by a score of 25-18. Kate Wasyliw and Ashley Voth both dominated for the Bisons, Wasyliw finishing with nine kills, three aces and one block while Voth finished with 11 kills, one ace and one block. Playing on the same night, the men’s volleyball team, however, did not share the same fate as their female counterparts as the sixth seeded Bisons were upset by the eight place Wolfpack by a score of 3-2 (25-19, 21-25, 19-25, 25-19, 20-18). In the first set, Thompson Rivers, led by freshman Kevin Tillie, unloaded a flurry of spikes on the Bisons defence that put them ahead 25-19. Thanks to key desperation plays and a strong amount of kills, the herd took control in the second eventually taking both second and third sets 25-21 and 25-19. The hard-fought battle continued in the fourth with TRU finding a way back into the game with a stingy defence that compiled four blocks and an offence that totaled 14 kills to win the set 25-19. The Wolfpack eventually took the tightly contested game by pulling ahead in the final set by a score of 20-18. Chris Voth led all Bisons with a total of 17 kills, followed by John Galloway, who tallied 13 on the night. Bison Sports estimated a crowd of 75 for the women’s game and 125 for the men’s. Both Bison’s home games, as per usual, were played back-to-back at the Investor’s Group Athletic Centre. The following day, Jan. 9, the Bisons again defeated the Wolfpack 3-0 (25-19, 25-16, 25-16) in women’s volleyball while the men’s team lost to TRU 3-0 (25-22, 25-19, 25-10). The women’s volleyball team will stay in the province the weekend of Jan. 15-16 as they play host to ninth place Simon Fraser University. The men’s team does not play again until Jan. 22-23 when they visit third place University of Alberta.